I've not travelled at all really. Did three weeks riding around France on a motorbike. Went up towards the Alps to Switzerland then through the mountains to Italy and back to France along the Côte d'Azur. Then down to the Camargue (to ride a white horse), before returning to blighty via Lyon. Rained just about every day, and rained heavily every time I sat on the bike. Gale force winds on the return journey ... Storms that killed 9 when it got to Spain. This was August and September BTW, not deep into winter. Apart from two nights (nowhere to pitch one in Geneva - I was too damp by the time we got to Arles to think about pitching a tent), every night out was spent inside a tent. So cold in Northern France (first night out) we slept in all our motorbike gear - and still got cold. Happy days! About the only thing I want to see outside of Hertfordshire, is the Grand Canyon. Never going, can't be arsed with the security BS. Since I was young (8 or 9 possibly) I've been able to go into any field, and be in awe of the marvels in front of me. Honestly, nature, our natural surroundings are mind blowing. I'm immensely proud to say I've managed to grow grass from seed. It's just a-maz-ing! Talking to people, brings the most interesting 'ventures to life too. Me and Mrs Freddy were sitting in Costa at Brent Cross one afternoon not long ago. Two (older - just) ladies sat at the table next to us. They spoke in a foreign language that was hard to place, with me thinking Spanish, herself thinking Italian. As Mrs Freddy is seldom wrong about anything (she'll never read this) and there was some Italian lilt to the phraseology I was disappointed I may have guessed badly. Bear in mind it's a noisy mall, and Costa is next to an escalator, as well as being full of talking customers .... So I asked. They were both Spanish, and the one I had spoken to had lived in the UK for over 40 years. Her sister was here on a visit. We were then entertained, for at least 45 minutes, with a concise version of the ladies life. Her sister couldn't speak much English, but she nodded appropriately from time to time. We laughed a lot, we were surprised a lot, we were impressed a lot. Basically, we wanted her for our mum! My grandson at 12 years, had already seen more of the world than I will ever see. I'm a bit jealous he's been diving in Egypt, though more worried than jealous (in hindsight) he left Sharm airport only a couple of hours before the tragic Russian flight ... (Mrs Freddy stills gets sick just thinking abut it.) I'm happy he's been to see Santa way up in Lapland, and been to see Disney in America. He's dived off the Canaries, and Cyprus already too. He deserves these pleasures, he's a great (little) person. What an interesting and thought provoking reply, one that leads me to suggest that you have indeed travelled, or are a traveller by nature, even if you have not filled up many passports - something which, frankly, is increasingly seeming to me to be a minor detail. One who can find interest and adventure and beauty in a field, or be open and curious enough to strike up a conversation with two Spanish speaking ladies at a adjacent table at a cafe, and learn their stories, is a traveller - and is one whether they are home or somewhere exotic and far away. As the philosopher Henry David Thoreau once said of his meanderings around Concord,Massachusetts - I have travelled much in Concord. You have travelled much in Hertfordshire. And of course the very soggy trip to and through France. I have experienced something similar, although not on a motorcycle, and recognised with a smile the experiences you write of. Such journeys do make for pleasant memories, despite the discomforts at the time. I always wanted to travel and see the world and engineered my life and career so that would be the logical outcome. Journalism and photography have taken me all over the globe, and at somebody else's expense. i am very fortunate and feel very privileged to have seen as much of the world as I have and I remind myself of that often. Increasingly though I find that some of my most interesting travels occur around home, on long bicycle rides through the lanes, rather than taking a jet to the far side of the world. Part of that is because the hassles and unpleasantness of airline travel leeches much of the joy and romance out of the actual act of travelling, and patly because I have come to understand that a wonder at the world, an interest in people, history and a love of beauty does not require an exotic backdrop but can be felt and enjoyed on an English country lane, astride a bicycle, as well as anywhere else. My own children have travelled far more than I did at their age, as your grandson appears to be doing as well. That is indeed a chilling thought, the proximity to disaster with their having flown out of Egypt that day. Thank God they came home safe. It's a worry. And it's not like he or his dad and new wife make sure we are kept informed of safe journey arrivals either. I had a conversation with my grandson before he left. "Don't be silly, my dad wouldn't take me anywhere that wasn't safe." Well, I didn't get to take Mrs Freddy to Egypt with it being her 'surprise' honeymoon destination, because of attacks on tourists a month or so before the wedding (I think 5 or 15 killed that year) and despite her lifelong desire to go there, we haven't yet felt it safe enough to visit any time since. Even our next door neighbours who went to Egypt EVERY year, stopped going two years ago, and now visit the Canaries instead. It's refreshing to hear of someone else who doesn't take the world around them for granted. So many are blind to wonders in front of them. As for being labelled "a traveller", I will take that in the spirit it is intended, thank you. But in some circles, being referred to as 'a traveller' might not be taken in such complimentary terms. Alas no place is really safe these days. One has to make the best of things. Even so I am not sure I would have been taking my wife or kids off to any place in the Middle East (other than, perhaps, Dubai) or North Africa. Too many fruitcakes. And professionally, I have no interest in covering terrorism, political unrest or being embedded with combat units along anybody's front line. I have great respect for those who do these things - indeed one of my friends regularly covers some of the seediest and most violent pockets of central Africa, but not me. I have no calling in that direction. Risk, I don't mind - but 'clean-cut' risk, that of nature, wild animals, and remote wilderness environments, not deliberate attempts on my life by religious fanatics with black plastic sunglasses and bad shaves. As for cycling, I have many many thousands of miles under my belt, excellent bike-handling skills, road sense and much experience at paying attention to my environment when I am out and about. That said, I would not be too keen on wife of kids cycling the same roads I do. Not at all. Back on the subject of your shiny leggings, did you decide to keep the M&S pair? Both pairs are going back, but I intend to re-purchase a size 12 when I can find a pair that has been made to the same quality as the size 14's. While there's little between them, the 14's did pucker up around the knee in a way the 12's didn't. It may be the 14's weren't quite tight enough. Back in the day, I owned PVC trousers for use when I frequented a fetish club to indulge in my high heel wearing needs. There's a lot to be said for owning a pair. Technology has improved clothing during the past 30 years, and stretch-anything is now de rigueur. I would imagine the current range of materials would be a good deal more comfortable, and less prone to cracking or tearing while being worn. I look forward to hearing about a purchase. I hadn't thought about the technological advances in materials technology. Interesting point. So PVC has sort of been overtaken by newer, but similarily sleek, shiny rock-chic style fabrics? (Pardon my rather dated and stodgy ignorance) Or has PVC itself improved? The 'travelling' comments above are interesting and, yet again, have parallels with my own experiences. I do not claim to be widely travelled and, until fairly recently, was unlikely to have a foreign holiday of any substance as I (i) I had better things to waste money on; (ii) could easily get bored with most sun-worshipping/sightseeing activity; (iii) have no sporting interests whatsoever; (iv) resented the time and effort spent in getting to an airport at some unearthly hour, going through increasingly tiresome formalities and then flying over my own house some hours after leaving it. My wife, however, has always been quite adventurous and had travelled widely overseas (as well as living and working elsewhere in Europe) before I met her. Something I did greatly enjoy and did almost annually in the 80s/90s was to spend a week on the English canals in a narrowboat, as one of a group of like-minded friends. Relaxing, yet active, convivial and never boring, I found it an ideal way to unwind. Alas, growing family and other commitments within the group effectively put paid to this annual treat, although the participants do remain in touch for other occasional social events. Recent years have however resulted in some changes, largely due to increased leisure time and less concern over finances. In particular, we discovered cruising (on a ship, that is!) and now have an annual cruise with several further ones in mind. It isn't our only holiday or outside activity but it is proving an enjoyable one with a very acceptable blend of relaxation and change of scene - not to speak of good food and, usually, good company. There are certainly some areas of the world that I would not wish to visit, for cultural or political reasons. High on the list is anywhere connected with current or recent terrorism, for obvious reasons. As I write, I have a stepson serving with the RAF 'somewhere in the Middle East', whose role is (I understand) not unconnected with some long-overdue and welcome news breaking today; draw your own conclusions. Fortunately, his work does not involve front-line personal exposure. I am reasonably widely travelled within the UK. An interest in railways and a need for business travel in a former life both saw to that. But nowadays I do not so often stray from my home area; travelling costs (whether by car or public transport) and traffic jams are no encouragement to exploration as distinct from necessary forays. And so many so-called 'attractions' prove either mediocre or a rip-off that I am wary of them. Almost all of my travels for a good many years now - or at least a very high percentage of my travels - have been for work. I am increasingly becoming a homebody in my down time, quite happy to explore the lanes on my bicycle or sit in the back garden and improve my mind with a Mickey Spillane or Perry Mason. I like being in interesting, far off places - sometimes - but I do not like travelling there, the exact opposite of my youth when it was all about the journey, and the feeling of liberation I felt when I started off. The destination was nearly irrelevant. Nowadays the journey - typically by air - is deeply unpleasant as a rule. I can still enjoy settling in for a long train journey, up to Scotland, say, or a sea voyage (not on a glitzy cruise ship, never been on one of those, but on an expedition) but those opportunities do not come up often. Generally it is air and a trip to the airport has become to me like the halo before a migraine. Something I did greatly enjoy and did almost annually in the 80s/90s was to spend a week on the English canals in a narrowboat, as one of a group of like-minded friends. Relaxing, yet active, convivial and never boring, I found it an ideal way to unwind. I've never been big on holidays, ever. I have too many times, watched people struggle through 50 weeks of the year, to ensure they had a good time for their two week holiday. Not for me. I prefer 50 weeks of having a good time, and two weeks of wall-staring (if it came to it). "Life" is a holiday to me, even when working. When we're away and Mrs Freddy is doing her sun-lounger work-out, book in hand, I'm either exploring the (usually desolate) sea-bed when snorkelling, or seeing how far I can walk without being missed. Generally it is air and a trip to the airport has become to me like the halo before a migraine. For at least one year, we had three holidays, and for a long period, two a year. Ibiza in September (and sometimes May), Lanzarote in February. These days, air travel is so unpleasant, I just don't want to go. It's never been a pleasure, though I like airports, (so romantic) but air travel has never been enjoyable at all. While Mrs Freddy used to try to entice me with; "Where d'you want to go? I'll pay!" Even a free one is unattractive when you have to go through the security procedure. There were some periods when 'work' involved air travel (my brother travels extensively to the Far East every other week), were that the case now, I'd be looking for employment elsewhere. Root canal work, is quicker and less painful. I agree with much of the above regarding the over-hyped holiday that becomes a holy grail to so many, regardless of cost, time and stress. Although cruising (and it is by no means a 'luxury' form of travel, unless one chooses such) has re-kindled my need for a relaxing change of scene, I too could cheerfully go without any significant 'away-break' as there is always something worthwhile to do at home or nearby. That said, our recently-completed seaside flat (intended for family and friends to use as a bolt-hole) does provide an enjoyable home-from-home and is pefectly viable for a day trip or a couple of nights, being an easy 48 mile car ride away (65 minutes consistently). My brother and his wife have owned a narrowboat for many years. Great fun, although I am not often invited aboard (despite various plumbing and joinery jobs done on same). The 'servicing' cost can be fairly significant, and the limitation posed by home-base location can be a damper when a trip in further parts is desired. But I guess, Freddy, that the Grand Union would be within easy reach of your home and a mooring there (if you can find one) is a pretty good place to start from - although somewhere on the BCN would be even better if not perhaps so salubrious. I must say the idea of floating along a canal - something I had not thought of previously and been only dimly aware of - is really appealing. I love the imagery it inspires! The BBC did a 2 hour film called The Canal, if I remember the name correctly. It was the UK version of a scenic type film done in a Scandinavian country that did surprisingly well, mindful there was no diction or human contribution. I started watching The Canal thinking I'd get bored in about 5 minutes ... Well over an hour later, I had to pause it to go to bed ... Some of the information provided by silent text on-screen was fascinating for anyone interested in history or geography. It may well have been that video that had stimulated my subsequent interest in owning or using a narrow boat. I possibly got caught up in the theatricality of it all. The 'servicing' cost can be fairly significant, and the limitation posed by home-base location can be a damper when a trip in further parts is desired. But I guess, Freddy, that the Grand Union would be within easy reach of your home and a mooring there (if you can find one) is a pretty good place to start from - although somewhere on the BCN would be even better if not perhaps so salubrious. With annual holiday costs typically sitting at £1200-£1500 for us two on a 'budget' holiday anywhere abroad, I would be very disappointed if the annual cost of ownership of a narrow boat was as high as that. Plus, provided insurance costs weren't prohibitive, I wouldn't be adverse to hiring it out. I priced up weekend hire while looking at purchase prices, and weekend/week long lets were staggeringly expensive. I think one 'modest' venue in the West country somewhere wanted £800 for a Friday to Monday let. No heated swimming pool, no jacuzzi, no maid (ahemm) service either. £800! The ship was/is owned by an American outfit, and tipping was required everywhere on everything (as best I can make out). It was possible to have 'tipping packages' included in the holiday price, but the couple I know were still compelled to tip their waiting staff at the end of the cruise anyway. I think the holiday cost them the better part of £1800 each and lasted a week I think. (Might have been 10 days, I can't remember exactly). It didn't compare well to a 2 week stay on land, even with food included, and the food wasn't that great given the price. I guess it would depend on how many it would sleep and whether or not you were looking to hire during school holidays when everything goes nuts. The idea of a canal boat is quite appealing. It woukd be very appealing on The Contnent as well, with more places to go as well. I identify with your typical holiday cost for two. In my case, a modest 7-day cruise plus a 7-day hotel stay afterwards costs around £1900 for the package (for two) and there is little need for further expenditure unless one goes overboard (sorry!) with drinking and excursions. Let us take £2000 as a sensible benchmark. This is a little more than I expect retention of my seaside flat to cost annually - the main expenses being council tax and buildings insurance, with occasional repairs etc. Running costs are small and partly offset by savings at home. All in all, a non-trivial but affordable (and controllable) cost of a readily available and flexible leisure facility. Yes, you might find a narrowboat can be kept afloat at a comparable figure but I don't know offhand what the typical average annual narrowboat costs are; I will ask my brother and report back. Mooring fees can be high and the licence is not exactly trivial, whilst periodic servicing (dry dock etc) is somewhat unpredictable (rather like owning a secondhand car) and does not come cheap. That said, the capital cost of a reasonable 'used' boat is likely to be somewhat lower than even a small holiday property. And both could be let out to produce a useful income; narrowboat hire charges do seem to have increased significantly in more recvent years, which is good for owners but not for hirers. Tipping is a sore point in the leisure cruise industry and attracts a lot of controversy and comment. I have tended to go on cruises which do clearly include all tipping in the price and which certainly do not require any supplementation - although a small end-of-cruise gratuity to a helpful steward or waiter is always an option. I don't quite understand your friends' dilemma without knowing all the details, but (aside from a service charge per purchase on bar drinks and things like a spa or gym), there should be no obligation to tip on top of a clearly-stated 'tips included' holiday price, or a specified extra charge for tips added to one's onboard bill. And, even then, it is normally possible to insist on the extra charge (which is typically £7 -10 pppd) being removed or reduced before it is added to the bill; some people like to vary it or to make personal gifts direct to those most deserving. Caveat emptor is the watchword, as always, and beware of US cruise lines in particular. The usual 'excuse' for compulsory tips is that the crew earn low wages and rely on tips to earn a proper income; this may well be true (although some cruise lines don't restrict wages) but it is still a distasteful process. In my book, a tip is only valid when exceptional personal service has been given (on request or by necessity) and is entirely at the giver's discretion; it is not to be expected simply because someone has done his job, whether well or badly, and I heartily dislike this difficult-to-avoid expectation. We seem to keep going off topic on this thread. My leggings. Recieved them on Saturday and have tried them on. Had a good look at them. I can find no fault with them. The right cotton has been used and the sitching is straight. Fit wise seem to be good around the waist. little tight around my legs, which is fine. Length wise maybe an inch to long. I can't make my mind up on that. Couple of creases down my leg, but that is only to be expected. Yes indeed, and several of us have gone off at interesting tangents - and why not? But, having started this thread, I would be pleased to see further comment on the YSL boots (or similar footwear) if anyone has a view. Exactly - why not? I've enjoyed the tangents and learned something about the idea of canal boat holidays. On the subject of unisex boots - the original topic of the thread and one of interest to me - I do not know much specifically about the offerings of YSL, but I am certainly pleased to see more interesting offerings along these lines. I think it would be nice to see barriers broken in both of the areas that limit men's choices in boots - heels and boot height, and preferably both. I quite like tall boots as a fashionable item (heels optional). But the wearing of tall boots by men - unless they are actually going horseback riding - seems to be off limits, regardless of heel height. There is no logic to it. I've dug into the history of boots and fashion, even contacted some prominent museum curators and history-of-fashion experts asking about this curious phenomenon and they can't explain it either and similarly see no logic. 'Boots are theatre', as one put it to me, and men foreswore the notion of theatrical dressing and fashion in the 18th century as part of the Great Male Renunciation, as it became know. While boots remained practical wear in horse and buggy days, and thus legitimately still worn, when the automobile came to the fore in the early 20th century they were no longer worn by men - except perhaps those on motorcycles. And when fashion designers made tall boots part of the sleek new look for women in the early 60s, what had been a neutral item became feminised and therefore no longer wearable by men except under the most traditional of circumstances - on horseback. A belated act of renunciation that has its roots in the mid-18th century and the so-called Age of Enlightenment. Isn't irony wonderful? I suggest that exchanges on holidays, leggings and other subjects remain perfectly valid, and mutually interesting, but are perhaps best conducted (or continued) in a dedicated thread elsewhere. So, I propose that the next person with such a comment in mind could open that new thread accordingly. I don't know what might be done to reintroduce the long boot for men, whether with a heel or not. But it does still exist in other cultures, as part of traditional dress (e.g. Eastern Europe) or by so-called 'cowboys' in the Americas. If we were not actively discouraged from celebrating British history, we might be able to recognise more tangibly the impact of people such as the Duke of Wellington, who (rumour has it) advanced the cause of boot-wearing just a tad - quite apart from defeating some undesirable foreigners who were causing us trouble (something that of course simply doesn't happen today). Now I am not going to claim that these are gorgeous or elegant boots - fashion comes in many guises - but they are tall, varying in height from, as I recall, 6" to 16" and they are worn by men and women alike. Whether the male demographic is buying the taller heights, or keeping to ankle or mid-calf heights, I do not know. But they are certainly very, very popular in the US and have been for the past few years. 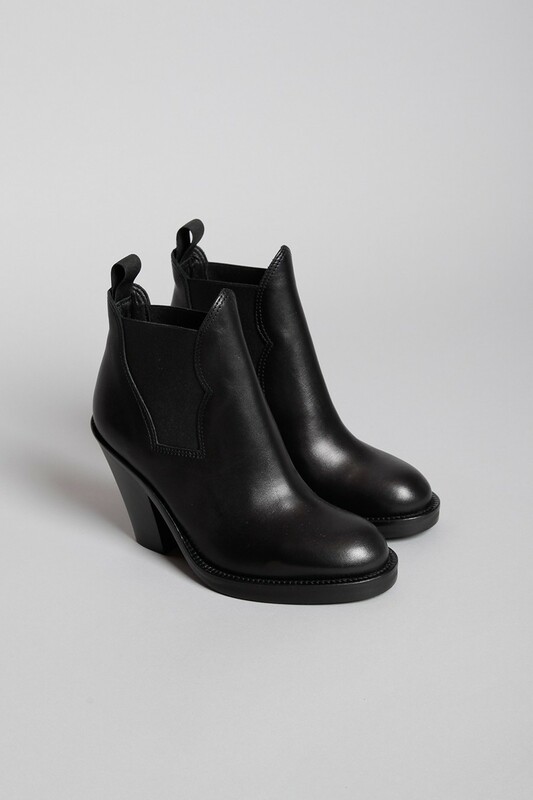 I have noticed the retailers are completely awash with ankle boots this year, many styled (as with the YSL boot possibly) on the original Acne Pistol boot. I think it would be nice to see barriers broken in both of the areas that limit men's choices in boots - heels and boot height, and preferably both. I quite like tall boots as a fashionable item (heels optional). But the wearing of tall boots by men - unless they are actually going horseback riding - seems to be off limits, regardless of heel height. 'Boots are theatre', as one put it to me, and men foreswore the notion of theatrical dressing and fashion in the 18th century as part of the Great Male Renunciation, as it became know. While boots remained practical wear in horse and buggy days, and thus legitimately still worn, when the automobile came to the fore in the early 20th century they were no longer worn by men - except perhaps those on motorcycles. As far as I can see (at my level of understanding) the only thing that seems to be a stopper to men wearing a long boot, is the wearing of them outside of any leg covering? A long boot under jeans or a trouser would be completely hidden, so wearable? A very high heeled item would be a slightly different challenge, but the main criteria for the long boot, is length, not heel height? So, is the thinking a long boot outside of any leg covering would be desirable? That being the case, what would be the leg covering, and where would it end? At this time, I am thinking 'jeggings', leggings, and not breeches (which I take to be something that ends at the knee).